Coll. No. 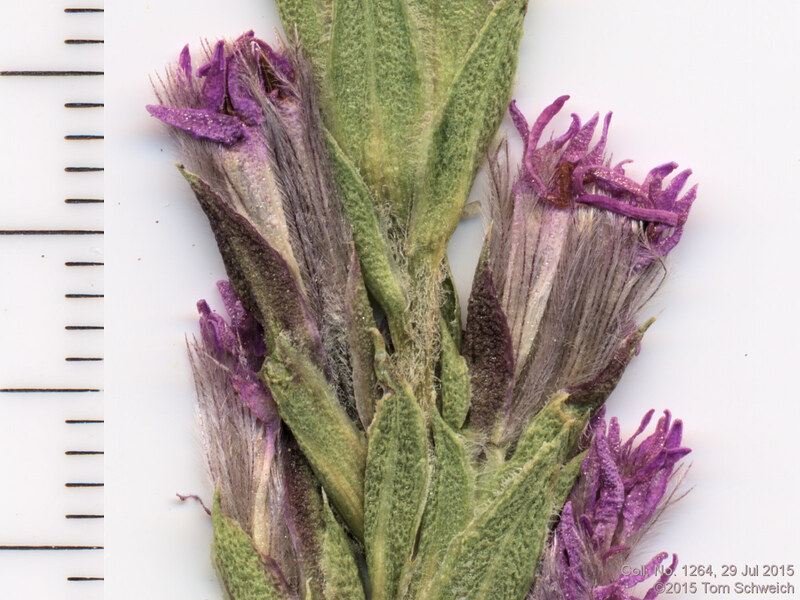 1264, 29 Jul 2015, characters observed: Perennial herb, to 32 cm. ; Leaves, cauline, alternate, 78 mm. × 3.5 mm. wide, gradually reduced above, linear, glandular punctate, margins, entire, revolute, sparsely hairy; Inflorescence, single heads in axils on short pedicels; Involucre, 16 mm. × 7 mm. wide, ±cylindrical; Phyllaries, in 2+ series, inbricate, 14 mm. × 3.8 mm. wide, glandular-punctate abaxially distally, margin, ciliate, scarious, tip acute; Receptacle, epaleate; Flowers, one kind; Disk flowers; Corolla, tube white 8 mm. + lobes purple 2.5 mm. ; Pappus, bristles, one series, 10 mm., plumose; Cypsela, 7 mm., hairy. Field Notes: Coll. No. 1264, 29 Jul 2015.